Hakuba village is located in northwest Nagano Prefecture, Japan. The Northern Alps are made up of a string of 3000 meter high mountains. 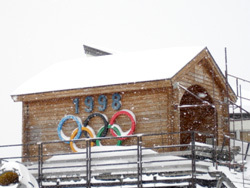 Hakuba held many events during the 1998 Winter Olympics, such as the ski jump and the Alpine Nordic combined events. 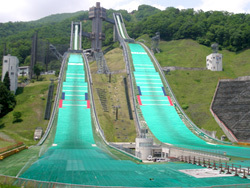 Hakuba Also annually hosts many other events such as the summer jump (ski jump) which gets broadcast all across Europe and also the paragliding world cup. Hakuba village is a delight for visitors. It is small and welcoming with some of the warmest and friendliest locals you will ever meet. 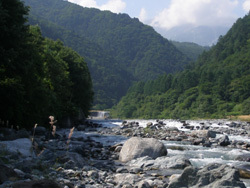 Hakuba offers many activities for you to do in both summer and winter. By day you can walk around the town and visit temples, local museums, scenic spots, souvenir stores and other great shops. And when your feet get tired from all the walking you can soak your feet in one of the many free foot spas around town. There are also many natural onsens in town as well to sooth both your body and mind. For the more adventurous there are also many things to do such as paragliding, wake boarding, water skiing, white water rafting and back country skiing. And for the people who want an easier pace you could try the hot air ballooning, hiking along the beautiful mountain trails, fishing or even doing a day trip to some of the other great destinations that Nagano has to offer. Such as Matsumoto Castle, Zenkoji temple, the snow monkey onsen or you could even visit the fish markets or go for a swim in the Japan sea. There are 3 beautiful lakes a short 15 minute drive from Hakuba Village. They are great for swimming, canoeing, kayaking, fishing, wake boarding and water skiing in the summer. In the winter you can also go ice fishing. There are also lots of rivers that are spectacular in both summer and winter. They are especially popular with artists and photographers.